Living at our Arbor Village community is easy with monthly rent and no buy in fees. 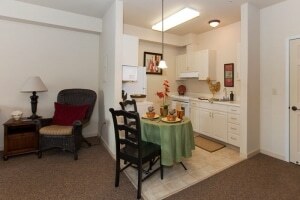 Each apartment in retirement and assisted living is a private unit. The apartments are fully carpeted, spacious areas, with large accessible bathrooms. Each apartment has its own kitchenette, an emergency call system, and individualized climate control systems. Amenities include a large elegant dining room, living room, activity room, library, TV lounge, a beauty and barbershop, billiard room, fitness center, rehab center, private dining room, computer room, and a theater room. Professional staff is on-site 24 hours a day for your care, comfort and security. Each resident selects the level of assistance they receive, while remaining as independent as they wish.